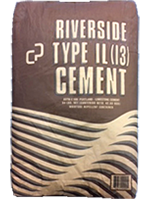 Type IL cement utilizes a Type I clinker interground with calcium carbonate and gypsum to produce a portland-limestone cement. Type IL cement is lighter in color due to both chemistry of the raw ingredients used for manufacture and interground calcium carbonate. Type IL cement is a light colored cement formulated for use in normal and architectural colored applications of masonry, concrete, precast and plaster products. Type IL portland-limestone cement reduces the amount of CO2 in the manufacturing process as compared to common ASTM C150 cements by approximately 9 percent while maintaining product performance requirements.